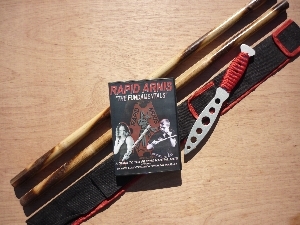 "A guide to the Filipino martial arts" starring Tuhon Pat O'Malley & Dayang Lucy O'Malley. 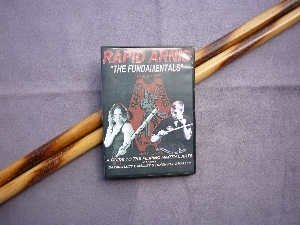 'Rapid Arnis' are famously known for their fast, rapid, direct approach to the combat applications of the Filipino martial arts. It is one of the most elegant and efficient FMA styles taught today. This instructional film brought to you by two of the worlds' leading FMA instructors will take you through all the fundamentals of this effective combat art of the Philippines. GRIPS, STANCES, STRIKING, BLOCKING, FOOTWORK, COUNTERING, TRAINING DRILLS, DISARMS and more. This DVD has no time wasting freeze frames or slow motions (you can use your DVD remote for freeze frames, slow motion and even to loop any section ) and with the use of voice-overs it allows for more than 89 techniques, 32 drills and 15 applications to be shown in this 62 minute training film. One of the most action packed training DVDs on the market today. 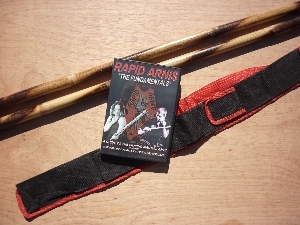 1 Rapid Arnis DVD, 1 pair of Palasan sticks and 1 small stick bag.